With Halloween right around the corner, this coffin build will make a perfect addition to your DIY Halloween decorations! Relatively simple to build, too! You can make this coffin with nothing more than a circular saw and drill. I tried the Japanese wood burning technique "shou sugi ban" during this build and am really happy with the result. Enjoy the build! The wood pieces needed for this coffin build are an 8 foot long 1x12 and an 8 foot long 1x8. 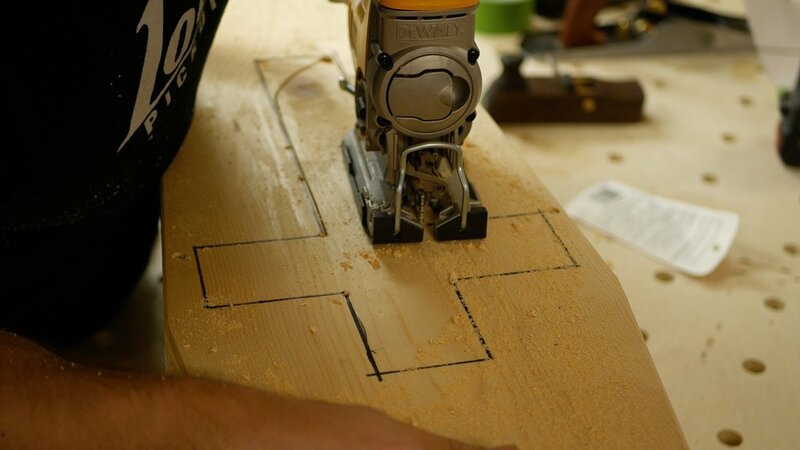 Cut your top and bottom pieces from the 1x12 to 40” in length, and then mark in 1 ⅛” from the sides at the top of your coffin and mark in 2 ⅛” inches from the sides at the bottom. Mark a point 9” down from the top of the coffin on each side, then connect your marks. These lines form the angled sides of your coffin. Clamp your top and bottom pieces together and cut along the lines you’ve just marked. 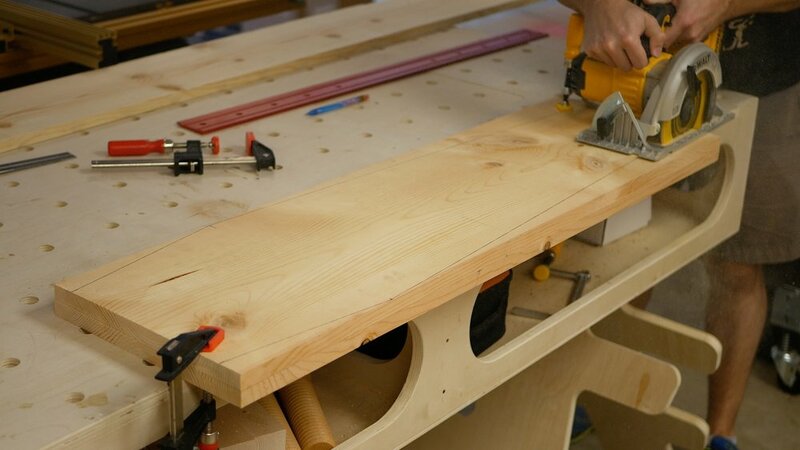 You can make this cut with a circular saw, jig saw, or bandsaw. I was left with a little bit of a rough edge from the circular saw since I made the cut coming from two directions, but I cleaned it up quickly with a low angle jack plane. Next, cut the longer side panels at 31 ⅛” inches and then, taking measurements on your actual coffin, start cutting the rest of your pieces. I cut my short side panels a little long and then transferred the angles onto the pieces based on my actual workpiece. The angles on the sides of the coffin do not need to match up perfectly, since this is just part of your Halloween decorations, not an actual coffin. It’s better to err on the side of leaving a gap facing the inside of the coffin, since you want the outside joints to be gap free. Just keep cutting pieces, marking the angles, and matching the angles on the miter saw or circular saw until you have your pieces assembled. If you follow the measurements I laid out here, the shorter side panels will be roughly 9 ¼” inches long, the top side panel will be roughly 7 ½” inches long, and the bottom side panel will be roughly 5 ½” inches long. Once your pieces are all cut, place the top onto the coffin and start assembling the coffin using screws. I used 1 ¼” exterior rated screws for this project. Make sure your pieces are nice and tight against each other during assembly, and leave a little overhang so that you can trim everything flush later. 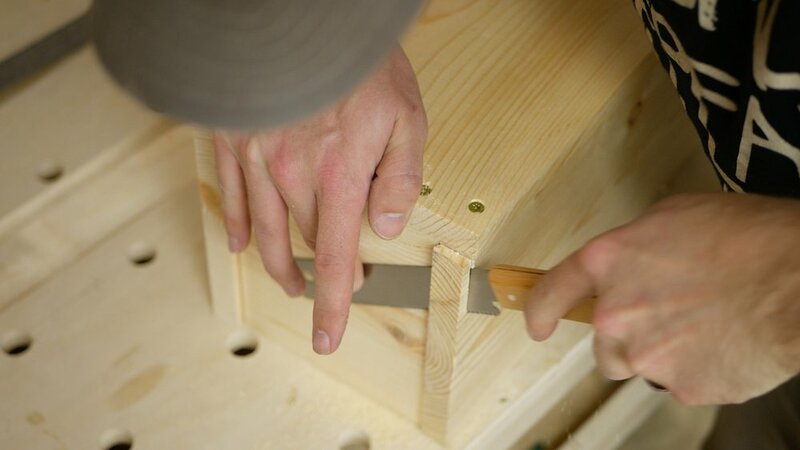 You can also add some bracing pieces to the inside of the coffin to hold everything together more strongly. I used some cutoffs from the 1x8 and just screwed them in place from the inside and outside. 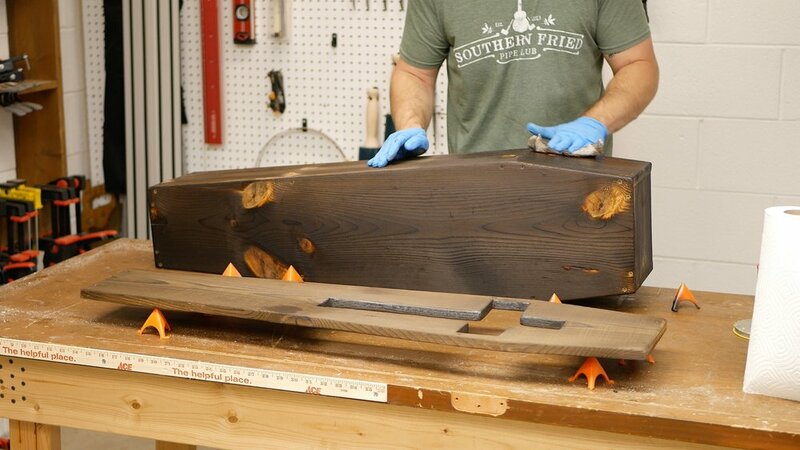 Next, attach the bottom of the coffin the same way as before, using screws. Remember to pre-drill all of these holes, as this thin wood is really prone to cracking. 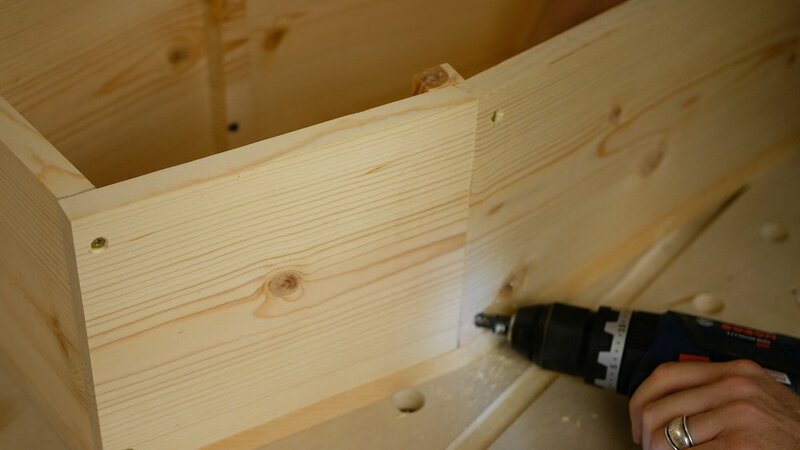 After attaching all of the pieces, use a flush trim saw and flush trim bit on a router to flush up the ends and edges of the coffin. These steps are totally optional since this is meant to look rustic. If you don’t have these tools available, don’t sweat it. These are just Halloween decorations! I decided to add a cutout to my lid and decided on the shape of a cross. You can use any spooky shape you’d like here. I traced the shape onto the coffin and then used a jigsaw to cut it out. I also filed the edges after cutting out the shape to remove any jagged edges. Next, I did the really fun part of this project: burning the wood! This technique is called “shou sugi ban”, which is a traditional Japanese technique of preserving wood. This is the first time I’ve ever tried this and it was a ton of fun. I’ll have a link to the exact torch I used in the video description, and these torches are absolutely perfect for this task. The torch will run you about $50 and runs off of a regular 20 lb propane tank like you’d use for a grill. I decided to make the investment in the torch since I plan on using this finishing technique again in the future. If you don’t have a propane tank available, you could probably use a small propane torch like a creme brûlée torch, but that would take a really long time and I don’t think you’d get as consistent results. To burn the wood, you want to move the torch over the surface at a consistent speed, not staying in one spot too long. I didn’t want that kind of alligator char as it’s called, where the wood actually cracks in the burned areas. If you want that look, just hold the torch over the area longer. I don’t think this type of soft wood would hold up well to that kind of char, though. After your surface is sufficiently toasted, scrape it down with a wire brush. If I was doing this again on a softer wood like this pine, I probably would have found a hard plastic brush, as the wire brush left little scratches in the surface. For this project, that was fine since I wanted it to look like worn Halloween decorations, but I wouldn’t have liked it on a project I wanted to look cleaner. The next step is to either rinse off your wood or wipe it down. I decided to wipe it down with mineral spirits as I thought hosing it off might cause the wood to warp. It took three or four sessions of wiping to get most of the black charred pieces wiped off. This was a total mess and I’d definitely recommend wearing a respirator. For the finish, I used paste wax. Again, I wanted an aged look and the paste wax just gives it a little bit of protection. This coffin will be on my covered front porch, and will only be outside about one month of the year. Next, it was time to add a little flare to the piece. I decided to add some colored LED lights to the inside of the coffin to backlight the cross cutout. I strung in the lights through a hole I drilled in the back of the coffin and attached them to the inside of the coffin using CA glue. Between the paste wax and the leftover charred pieces, the built in adhesive on the LED strips wasn’t working well, hence the CA glue. After attaching the lights, I attached some fabric to the inside of the cross cutout to help diffuse the light. I picked up this fabric from my local craft store and just stapled it in place, making sure that I didn’t place it where it would get in between the top and sides of the coffin. Once I assembled everything, I decided the LED lights weren’t bright enough, so I picked up one of these clip on lights and a red LED bulb from my local home center. If I had more time, I would have just ordered another string of LED lights. I screwed the light onto the inside of the coffin, installed the lid, and it was done! This build was a ton of fun! I'm so happy to have this piece as part of my Halloween decorations. If you liked this build, check out my other woodworking projects here.